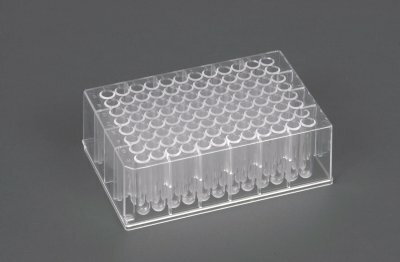 MicroResp™ is a unique microplate-based respiration system that enables the user to analyse up to 96 soil, sediment or water samples and test a range of carbon sources and/or replicates in a small compact space. While some sole C-source tests tend to select for fast-growing bacteria and rely on growth of organisms, MicroResp™ gives more immediate responses to these substrates and reflects activity rather than growth by measuring responses in the first 6 hours. MicroResp™ is currently being used to carry out colorimetric detection or 14C detection measuring CO2 evolved from carbon substrate utilisation in soils. This methodology can be adapted to suit any experimental schedule and microplate reader although calibration is required. 96-well 1.2ml Deepwell plate - carrier for the carbon source and the test material. 96-well microplate - contains the detection gel or in the case of 14C detection a 96-well isoplate containing NaOH soaked filter paper. MicroResp™ Seal - a two way rubber sealing mat which connects the two plates together. Filling Device - aids the user in the filling of the deepwell plate with solid material (e.g soil). Although MicroResp™ was developed to measure CO2 evolution over short periods (4-6 hours) at 25°C it can be adapted for any time period depending on the sample activity, and for incubation at any temperature, i.e. to mimic natural environmental conditions.